When you open a can of paint there is always paint on the lid. Some of that paint is usable. If you wash the lid of your paint can each time you open it, all of the paint will be usable. And, I mean, wash it thoroughly. Doing so will allow you to use it as a palette, which is especially useful for small projects. 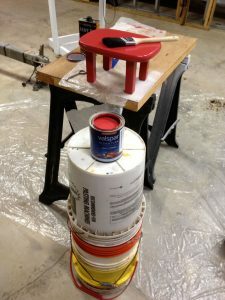 I put an entire coat on this stool with just the paint inside the lid. And for tightwads like me, who cannot stand to allow anything to go to waste, it’s a good feeling, like putting a little money in the bank. If you use all of the paint on the lid and have more painting to do, give the lid a quick rinse or immerse it in water to prevent the paint from drying before you get to cleaning it. Wash the lid when you wash your brush. Take Steve Johnson’s advice and don’t use the kitchen sink for washing brushes! When you’re ready for definitive cleaning, scrub that baby with a stiff brush and soap. Tap it back onto the can firmly. Speaking of which, cleaning the lid will make it easier to remove next time!